WASHINGTON –The federal income tax filing deadline has arrived and the IRS estimates it will receive approximately 12 million 2016 federal income tax returns and nearly 8.4 million extension requests in the final days of the filing season. E-file The IRS encourages taxpayers to file electronically. E-file vastly reduces tax return errors, as the tax software does the calculations, flags common errors and prompts taxpayers for missing information. Free File partners make their brand-name software products available for free to taxpayers earning $64,000 or less. Taxpayers who earned more may use Free File Fillable Forms. For the first time, taxpayers also can prepare their taxes from their mobile phone or tablet as well as computer. Taxpayers who changed tax software products, either using Free File or other software products, this year may be asked for their Adjusted Gross Income to verify their identity. See Validating Your Electronically Filed Tax Return for details. Refunds The fastest way for taxpayers to get their refund is to e-file and have it electronically deposited into their bank or other financial account. The IRS issues more than nine out of 10 refunds in less than 21 days. Taxpayers waiting to receive their refunds can use the “Where’s My Refund?” tool on IRS.gov or check the status of their refund through the smartphone app, IRS2Go. The “Where’s My Refund?” tool is updated once daily, usually overnight, so there’s no reason to check more than once per day or call the IRS to get information about a refund. Taxpayers can check “Where’s My Refund?” within 24 hours after the IRS has received an e-filed return or four weeks after receipt of a mailed paper return. “Where’s My Refund?” has a tracker that displays progress through three stages: (1) Return Received, (2) Refund Approved and (3) Refund Sent. Payment Options Many taxpayers who owe money often wait until the last minute to file. Taxpayers who owe have many payment options. They can pay online, by phone or with their mobile device using the IRS2Go app. Available payment options include Direct Pay; Electronic Federal Tax Payment System (EFTPS); electronic funds withdrawal; same-day wire; debit or credit card; check or money order; or cash. Some of these options are free; others require a fee. File an Extension Taxpayers who are not ready to file by the deadline should request an extension. An extension gives the taxpayer until Oct. 16 to file but does not extend the time to pay. Interest and penalties will be charged on all taxes not paid by the April 18 filing deadline. Although some people automatically get an extension – such as those in a federally declared disaster area – most people need to request one. One way to get an extension is through Free File on IRS.gov where some partners offer free electronic filing of the extension request. Extensions are free for everyone, regardless of income. Another option for taxpayers is to pay electronically to get an extension. IRS will automatically process an extension when taxpayers select Form 4868 and they are making a full or partial federal tax payment using Direct Pay, Electronic Federal Tax Payment System or a debit or credit card by the April due date. There is no need to file a separate Form 4868 when making an electronic payment and indicating it is for a 4868 or extension. Electronic payment options are available at IRS.gov/payments. 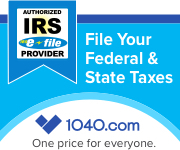 Taxpayers can also download, print and file a paper Form 4868 from IRS.gov/forms. The form must be mailed to the IRS with a postmark on or before midnight on April 18. Penalties and Interest Taxpayers who are thinking of missing the filing deadline because they can’t pay all of the taxes they owe should consider filing and paying what they can to lessen interest and penalties. Penalties for those who owe tax and fail to file either a tax return or an extension request by April 18 can be higher than if they had filed and not paid the taxes they owed. That’s because the failure-to-file penalty is generally 5 percent per month and can be as much as 25 percent of the unpaid tax, depending on how late a taxpayer files. The failure-to-pay penalty, which is the penalty for any taxes not paid by the deadline, is ½ of 1 percent of the unpaid taxes per month. The failure-to-pay penalty continues to accrue on any unpaid tax balance and can be up to 25 percent of the unpaid amount. Taxpayers must also pay interest, currently at the annual rate of 4 percent, compounded daily, on taxes not paid by the filing deadline. Installment Agreements Taxpayers who find they are unable to pay the entire amount of taxes due should consider filing the return and requesting a payment agreement. Most people can set up a payment plan with the IRS online in a matter of minutes. Those who owe $50,000 or less in combined tax, penalties and interest can use the Online Payment Agreement application to set up a short-term payment plan of 120-days or less, or a monthly payment agreement for up to 72 months. With the Online Payment Agreement, no paperwork is required, there is no need to call, write or visit the IRS and qualified taxpayers can avoid the IRS filing a Notice of Federal Tax Lien unless it previously filed one. Alternatively, taxpayers can request a payment agreement by filing Form 9465. This form can be downloaded from IRS.gov and mailed along with a tax return, IRS bill or notice. No matter how or when they file, taxpayers are reminded to keep a copy of their tax return and all supporting documents. And if all of that is too much to bear, remember, Tax On Wheels, LLC will be glad to handle it all for you. Just give us a call at 803 732-4288. This entry was posted in Blog and tagged extension, Installment Agreement, IRS, Tax help, Tax Return, Tax Tips on April 18, 2017 by Taxman. Caution: This is not an extension to pay taxes due by April 17, 2016! Read this carefully to understand the relief granted. WASHINGTON –– Hurricane Matthew victims in much of North Carolina and parts of South Carolina, Georgia and Florida have until March 15, 2017, to file certain individual and business tax returns and make certain tax payments, the Internal Revenue Service announced today. This includes an additional filing extension for those with valid extensions that run out at midnight tonight, Oct. 17. As always, please feel free to contact Tax On Wheels,LLC at 803 732-4288 if you need assistance with this or any tax related matter. This entry was posted in Blog and tagged Disaster recovery, Disaster relief, extension, IRS, South Carolina on October 17, 2016 by Taxman. If you filed form 4868 to extend the tax filing deadline for your form 1040, the extended deadline for getting your tax return filed is fast approaching. October 15, 2016 is the statutory deadline, but since that date falls on a Saturday, the date is moved to the next business day, in this case Monday October 17, 2016. It amazes me that when the human brain is given a deadline, it somehow determines that the best possible date to begin trying to meet that deadline is the 24 hours immediately preceding the deadline. While that may have worked for your 3rd grade spelling test, it tends to be problematic with tax returns. Bottom line, time’s up. If you work with a preparer he or she needs the remaining time between now and the deadline to make sure your return is correct. If you are a do it yourselfer, you need the remaining time to make sure your return is correct. Either way, it’s time to Get her done! This entry was posted in Blog and tagged extension, IRS, Tax Return on September 28, 2016 by Taxman. WASHINGTON — The Internal Revenue Service today urged taxpayers whose tax-filing extension runs out on Oct. 15 to double check their returns for often-overlooked tax benefits and then file their returns electronically using IRS e-file. Details on all filing and payment options are on IRS.gov but as always please contact Tax On Wheels, LLC at 803 732-4288 if you need assistance with your tax filing obligations. This entry was posted in Blog and tagged e-file, extension, IRS, Tax season on September 28, 2015 by Taxman. WASHINGTON — The Internal Revenue Service announced plans to open the 2014 filing season on Jan. 31 and encouraged taxpayers to use e-file or Free File as the fastest way to receive refunds. Give Tax On Wheels, LLC a call at 803 732-4288, we’re here to help. This entry was posted in Blog and tagged e-file, extension, IRS, Tax season on December 26, 2013 by Taxman. Further details on this relief, including instructions for responding to penalty notices, is available in Notice 2013-24. This entry was posted in Blog and tagged extension, IRS, tax penalty on March 23, 2013 by Taxman. Tax On Wheels, LLC is here to assist you if you need help with your W-2’s. Just give us a call at 803 732-4288. This entry was posted in Blog and tagged Amended returns, extension, IRS, W-2 on February 8, 2013 by Taxman. This entry was posted in Blog and tagged Disaster relief, Due Date, extension, IRS on October 31, 2012 by Taxman.